of Congress remains well below the historical average of 33% ." Even 33% sounds pretty pathetic!! 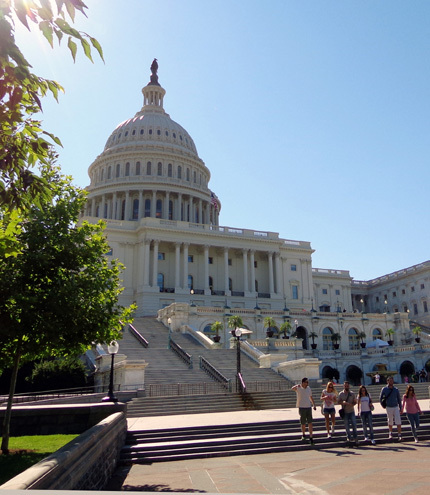 Partly because the elected men and women in both the Senate and the House of Representatives have recently hit a collective low point in job satisfaction ratings by the American public, we wanted to learn more about the inside workings of our government by touring the U.S. Capitol. Guess we're kind of in that category, too. We have a lot of respect for our own Representative. 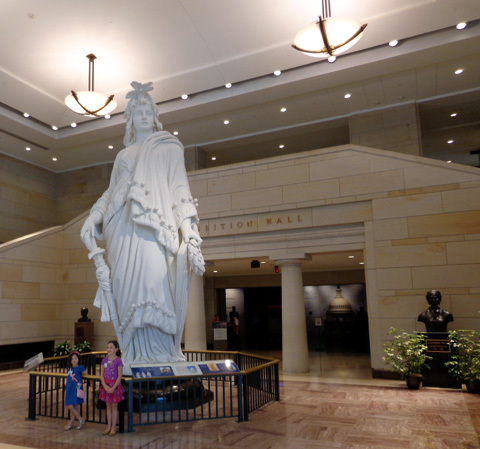 So when we decided it'd be a good idea to tour the Capitol Building while we were in D.C., we contacted her office to arrange a personal tour of the humongous building. That was a good plan. 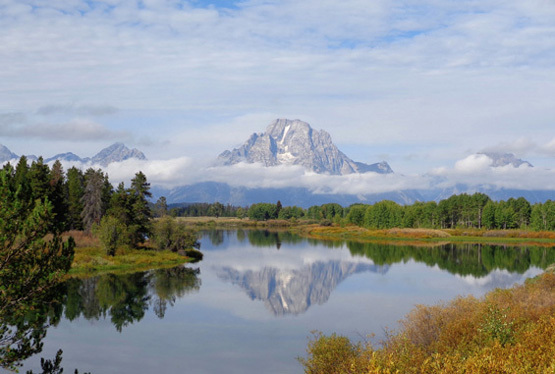 In fact, there was so much to see and learn that we'd like to do it again. 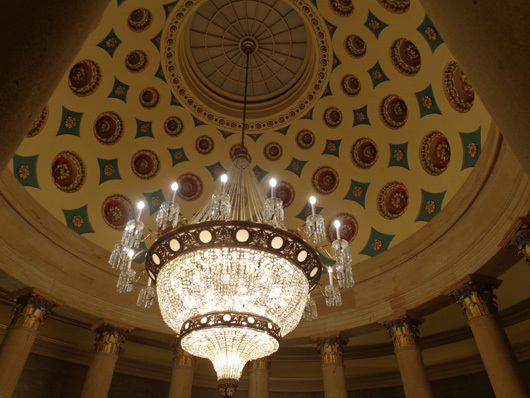 There are advantages to having a personalized tour of just about any place, including the Capitol. 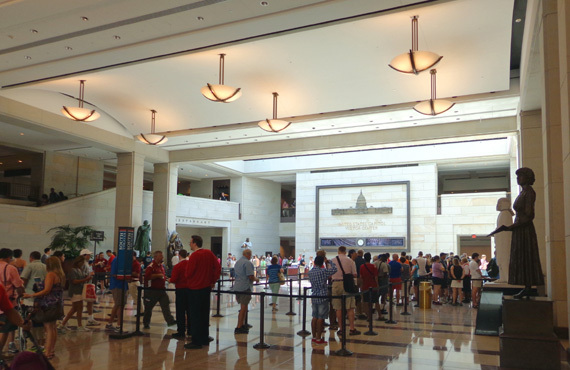 Anyone who can pass security can show up and tour the Capitol Building for free in a guided tour but you might have to wait a while in line on a busy day, you'll probably be in a rather large group, and you won't see as much inside the building as you will with a member of your Congressperson's staff. The line for generic tours begins in the Visitor Center. If you want a smaller, more personalized tour you can contact your preferred Senator's or Representative's office and make an appointment. That's what we did. Jim called our Representative's congressional office and made an appointment for a weekday morning the week of July 4. 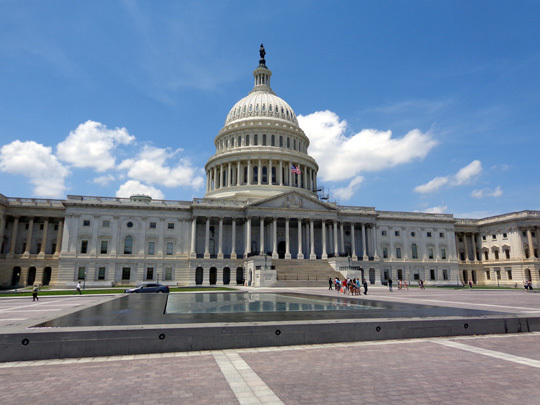 The upsides were being the only two people on the guided tour, which lasted two hours, and getting to see the Representative's office in the nearby Rayburn Building. The downside was that -- during the holiday week -- all the Congressmen and women were gone so we didn't get to meet our Representative. One good reason to like our Representative is her fiscal responsibility, both personally and as our representative in Congress. You're probably aware that Washington, D.C. is one of the most expensive cities in the country to rent or own property. 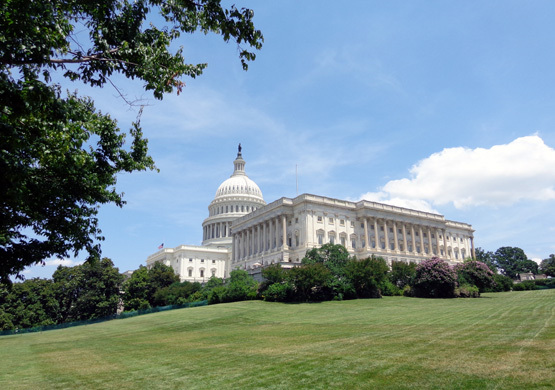 Many Congressmen and women not only maintain a home in their own state, they also rent or buy a place for the (rather few) days they are in D.C. That can get mighty expensive. 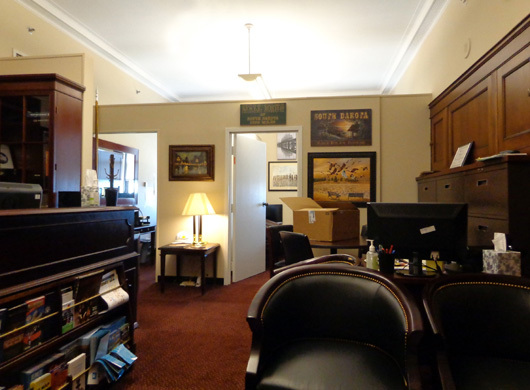 When we met our Representative's staff in her outer office before our tour began, we also got to see her inner office. She not only works there, she also sleeps there overnight when she is in town. She has beautiful paneled walls with storage, a professional-looking desk and furniture, and a comfy leather sleeper sofa -- very practical! 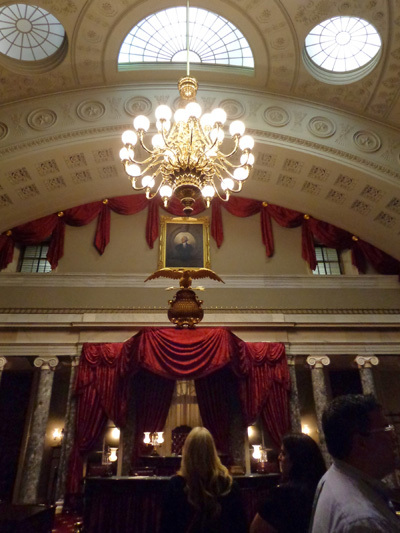 We really enjoyed our tour and learned even more about the history and workings of Congress than we already knew. The enthusiastic intern who showed us around gave us all kinds of interesting information and we got to go some places where folks in the large, generic tours don't go. 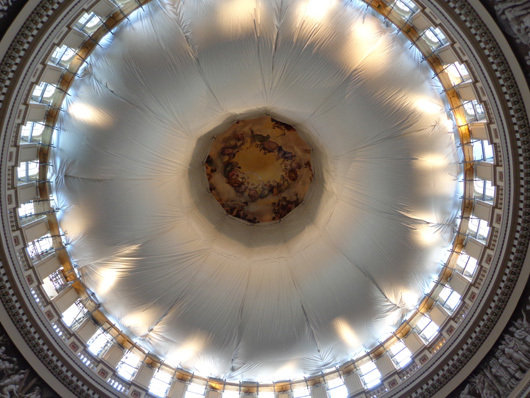 Here are some of the photos I took of the interior and exterior of the Capitol Building. One of the insights we got during our tour was how much walking Senators, Representatives, and their staff members have to do on Capitol Hill! Not only is the Capitol Building massive in size, the distance that many Congress-people have to walk from their offices to their House and Senate chambers, committee and caucus rooms, and other places is also massive. 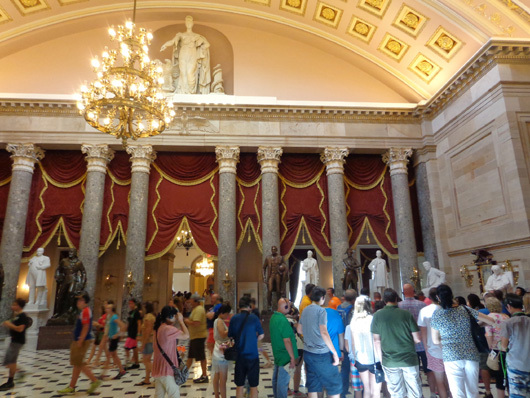 The National Statuary Hall was pretty crowded when we were there. 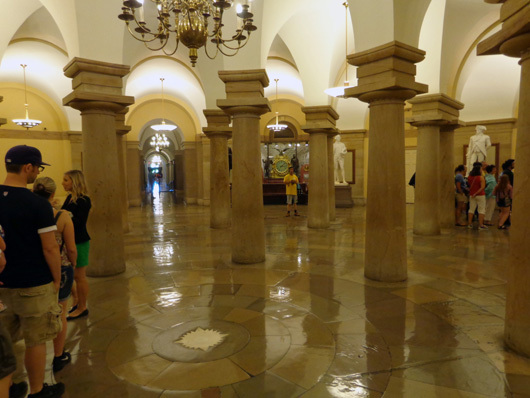 It took a while to walk through the underground passageways from the Rayburn House Office Building to the Capitol Building. We also had to go through security again (first time was entering the Rayburn Building) and wear a badge indicating whose office was sponsoring us. Before our grand tour the intern led us through the exhibition hall and watched an interesting 13-minute movie with us in a theater adjacent to the visitor center. 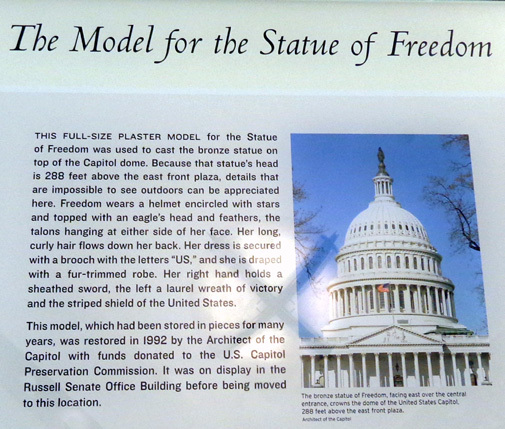 on top of the Capitol dome is located in the visitor center. I was able to take photos in some locations but not others. 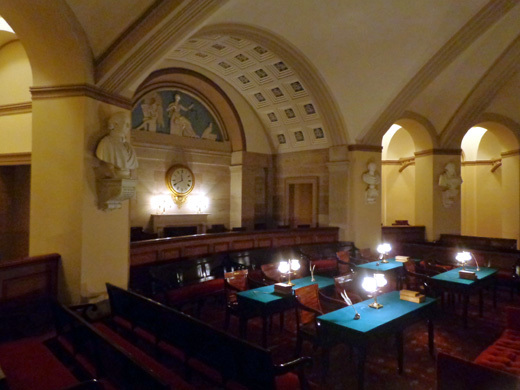 Both the Senate and House chambers that are currently used were open to the public while we were there because the members weren't in town. Those are two places where I couldn't take pictures. 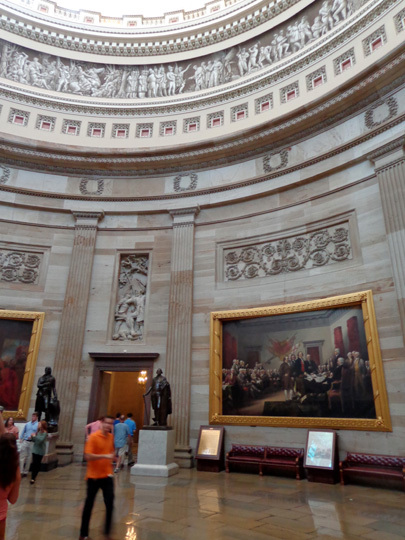 The large Rotunda in the center of the second floor is a highlight of any tour of the U.S. Capitol Building. 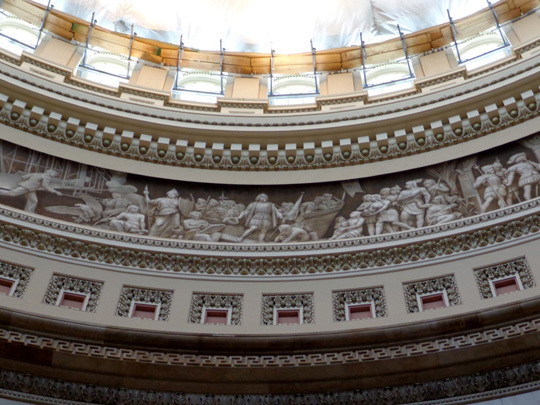 In the eye of the rotunda, 180 feet above the floor, is the "Apotheosis of Washington," painted in 1865 by Constantino Brumidi. 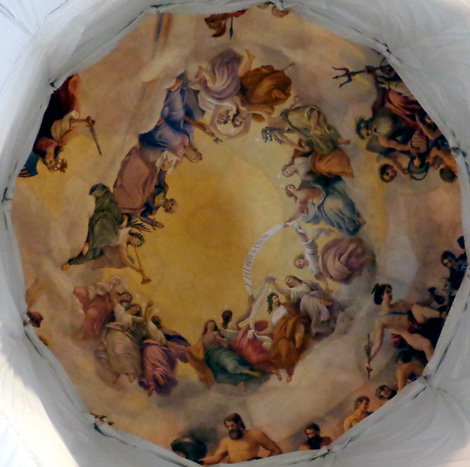 This link shows the entire painting in the ceiling. 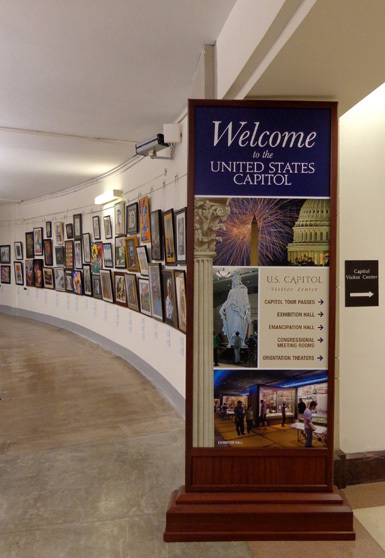 You can learn much more about the buildings and art on Capitol Hill on this website. 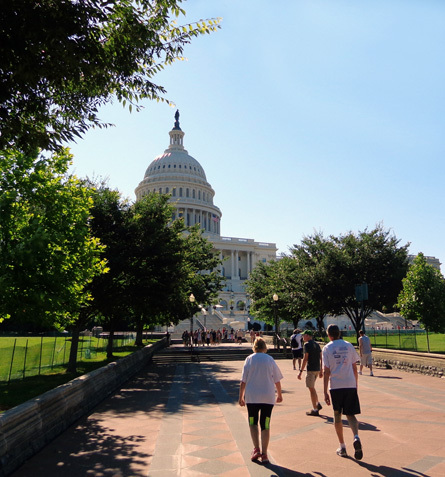 We walked around or near the Capitol Building on two different days. 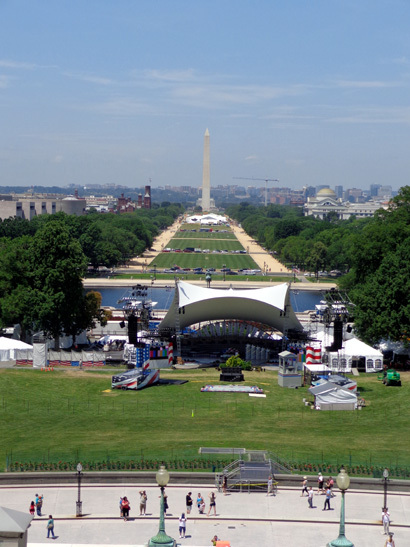 On July 1 a large grandstand, other structures, and fencing were being erected on the west side of the building for a big July 4 concert. After the Fourth crews were dismantling the structures. "Capitol Hill" really is on a hill. This is the view from the south. 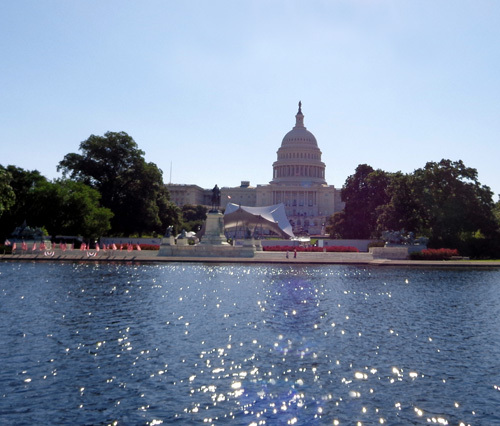 The east side of the Capitol has a smaller reflecting pool than the west side facing the National Mall. 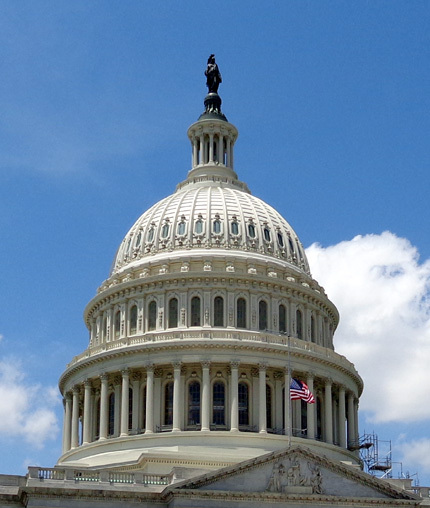 The bronze Statue of Freedom tops the Capitol Dome. 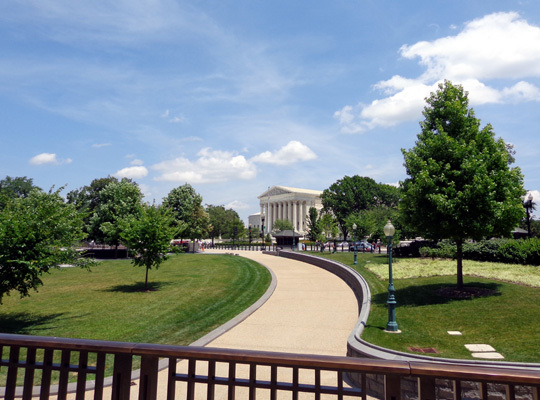 This view shows the west side of the Capitol Building across a larger reflecting pool. out for the Fourth of July. Looking west, we could see the Washington Monument. 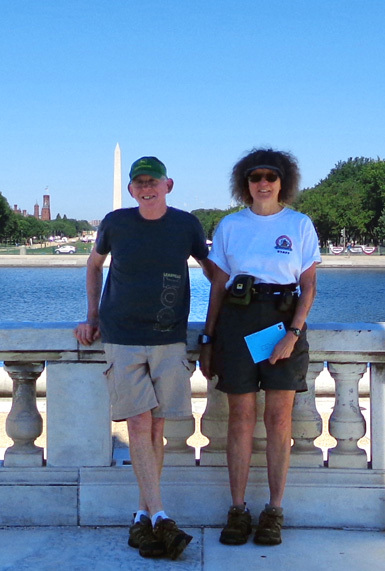 Another visitor took our picture in front of the reflecting pool. 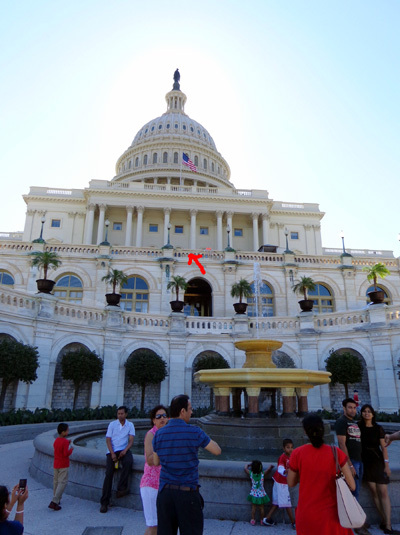 Arrow points to the balcony where presidents give their inaugural address. I took photos from there during our tour; one of them is farther up this page. 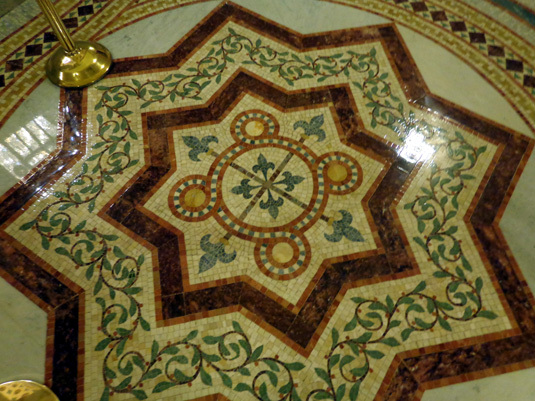 We highly recommend everyone do a guided tour of the Capitol. 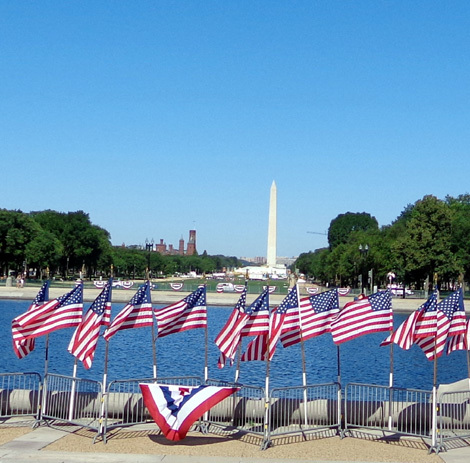 It's ironic that so many foreigner visitors have seen it but millions of Americans never have. Wear comfortable shoes and drink/eat before the tour because you can't take food or beverages inside the building. There is a public cafeteria in the visitor lobby. Since we were with a Congress member's staff person, we were able to eat in the staff cafeteria after our tour.